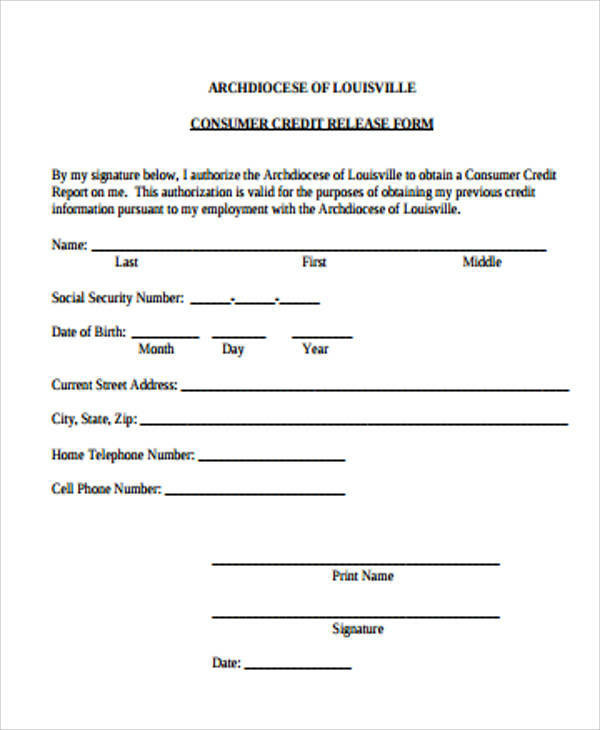 Credit release is a form of document allowing any bank or credit company to obtain your credit information for purposes such as obtaining a loan, applying for a consumer credit, or application for credit card approval. This is usually done when a credit company wants additional information about your person before they approve your application. 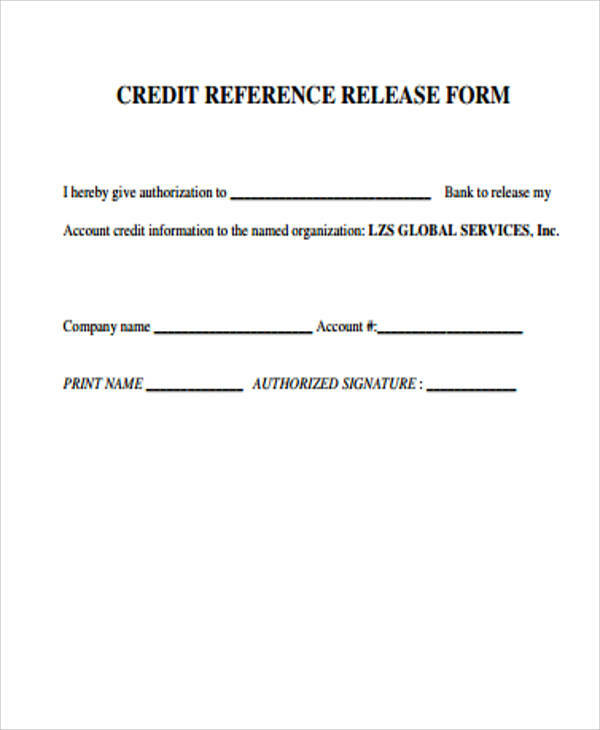 Our Sample Forms for credit release come with a variety of examples from different sources. These can be used as guides for consumers who may need to furnish a credit release form for their loan or credit applications to be approved. These are all free to download on either Word doc or PDF file. Oftentimes when you’re applying for a credit card or other forms of loan , you are bound to the terms and conditions of the credit company. This includes assessing and evaluating your credit capacity to ensure you will not default on your payments and ensure good credit standing. Once your application is approved, your credit limit will be based on your income and capacity to pay. This is often based on whatever information a credit company obtains about your financial capacity from other sources. Banks and credit card companies emphasize unconditional guarantees when collecting payment of all fees, charges, and penalties. 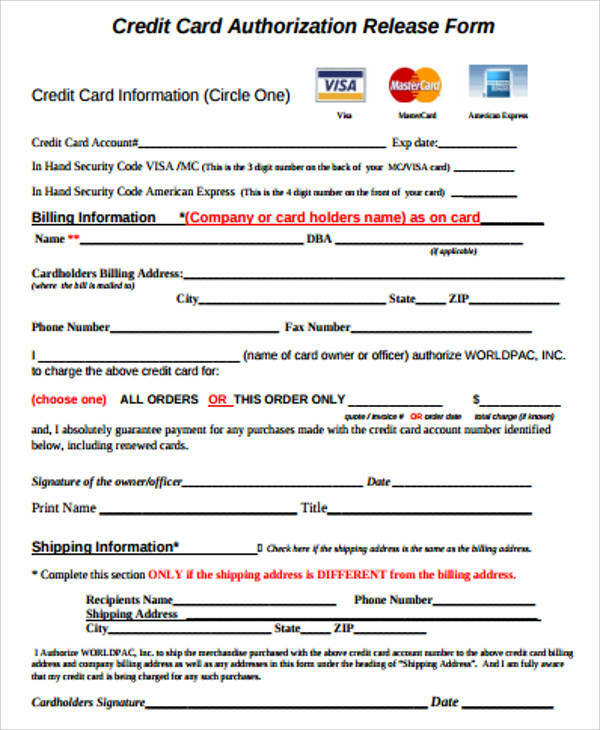 This is part of the guarantee that the cardholder is obligated to once he is eligible for the credit card or loan. In this regard, failure to pay may mean additional charges and penalties, which the cardholder will not be able to contest whatever legal proceedings may arise due to failure to settle obligations. 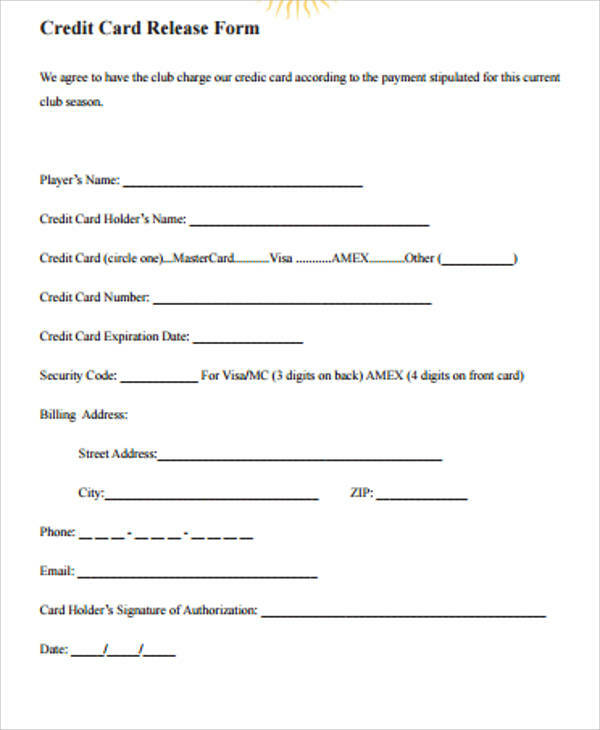 You may be made to sign a guaranty agreement by credit card companies who have the right to change or alter any provisions in the agreement like canceling the credit card or reducing credit capacity when the company determines you may not be able to fully comply or are in danger of defaulting on your payments. For other samples, please click on the link for Photo Copyright Release Forms. These are intended to help guide you in obtaining any form of images or videos that are otherwise protected by copyright. 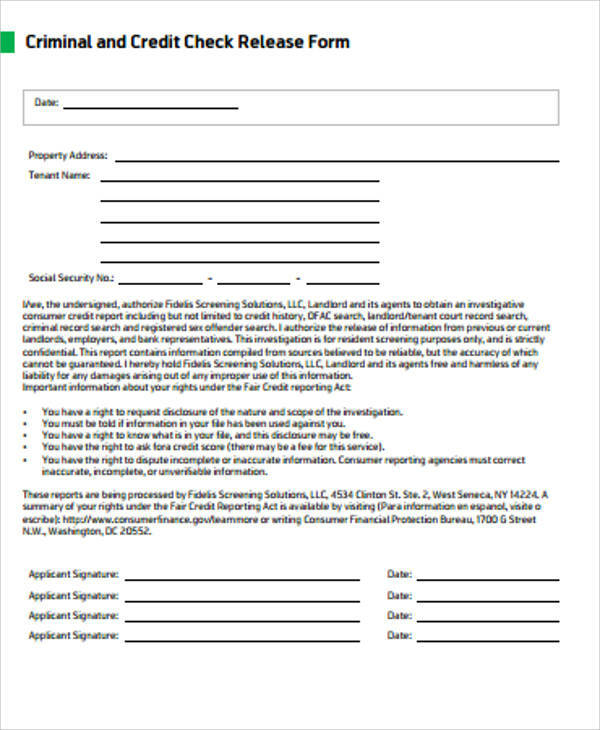 We also have Lien Release Forms that can be used for holding a security interest on a piece of property or vehicle that is used for collateral on debt payment. These are all free for downloading and can be modified for whatever user specification is intended. In an age where privacy is of the utmost concern, consumers are often in a dilemma whether to release additional information about them or potentially lose credit standing. 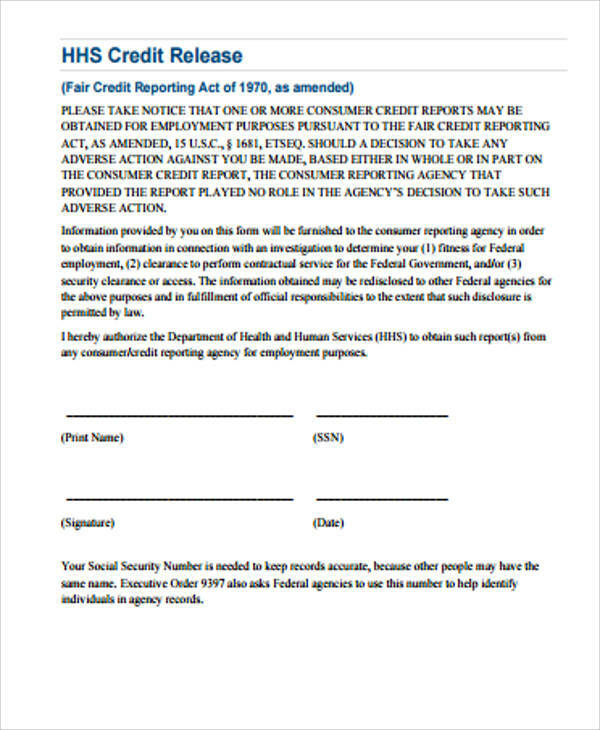 By signing a credit release agreement, you may unknowingly give away whatever information you have regarding your financial capacity and capability. It’s no secret that banks and credit companies share information regarding a consumer’s financial capabilities. They may compete on a business end, but ultimately, they close ranks when it comes to a consumer’s credit standing. That’s why more often than not, individuals find themselves declined when applying for a loan or credit card when he has a history of bad credit standing. You may not have revealed on your past arrears, but banks have an internal agreement to share information about a customer among themselves. For more of our sample forms, please check out Release of Information Forms that are free for downloading on our website.